This is proably going to be my shortest blog yet, but I want to do a quick update before I leave tommorw for 5 days- we're going on a expidition to Tsavo National Park (the largest National Park in Kenya and Africa). We had an early morning class on an amazing hill called Olosoito- took us about 20 min to climb to the top. The peak was riddled with hughe bolders I couldn't help but climb all over (it made me miss rock climbing so much). We also had an amazing view of our new surroundings- ranging from the beautiful Chyulu hills to the east, Amboseli NP to the west, and Mt. Kilimajaro to the South. This sure is a beautiful part of the world. On top of Olosoito. Kind of a sketchy climb. Well needless to say, but Halloween is not really celebrated in Africa. Nevertheless, all of us dressed up as best we could. Personally, I impersonated a man we have named "Father Shikamo" who was a resident of Rhotia, TZ. 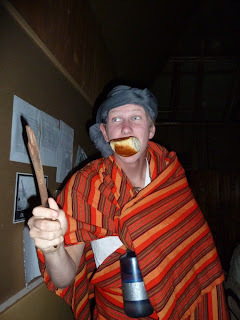 He ixbasically a crazy old man who spoke no Swahili, walked past our camp everyday at 4PM (of course all knobbly kneed), brandishing a wooden spoon which he used to terrorize school-children....I couldn't help but do him the honor of dressing up like him as best I could. It was an interesting day in our camp site, riddled with confused and almost scared looks from our staff- not exactly sure what we were doing. Most days of this past week we have had anywhere between 3-7 hours of class. Although we already gained a solid background of the main env. issues in E. Africa while in TZ, many of the issues here are unique to Kenya, so we have spent a great deal of time learning them in detail. especially through two field activities. 1) We administered a survey of residents of the Kimana Group Ranch (KGR), learning about human wildlife conflict in this region. The most prominent issue we learned about is Elephant raiding farms during the night, and trampling the crops of local farmers. Attempts to build eletric fences around KGR have occured, but have been futile because of poor planning and a lack of maintanance. 2) We performed transect walks and vegetation sampling of a rangeland in KGR in order to determine the overall site quality, which we found to be poor. We sampled such things as erosion, grass/herb species and height, and layers of canopy. I just finished writing papers analyzing the results of these two sudies...both took a long time, but they were overall very interesting!!! This day was a break from class. After working on assignments in the morning, I went to the market in Kimana, Kenya which takes place every tuesday. Recently, all of my socks blew away after I washed them, so I boght some in Kimana. As I arrived I was immediatly bombarded by Maasai Mamas trying to sell beaded bracelts, necklaces, and other jewelrey...I bought a couple and traded for a few more. After the choas, I met a man selling/making rubber shoes named Charles. He was a great man, and together we sat and spoke of life, love, and politics for about an hour. 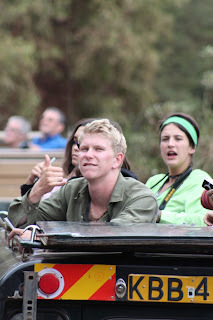 He was so happy to learn that I spoke Swahili, and together we practiced langauge. We became friends, and as I left he offered to fix a pair of my shoes. November 6- HAPPY 59th BDAY DAD!!! For the next 5 days we will be in Tsavo NP.....home of the "maneaters" The folklore is that during colonization, a pair of two male lions killed over 130 railroad workers in a few years. Furthermore, accounts of lion attacks on people have continued to this day in Tsavo (a couple were pulled out of their tent a few years ago). What I understand is that Tsavo is nothing to mess around with..........let's go see how far I can push the limit (safely of course). The results are in, and they are what was expected. Incumbent Pres. Kikwete (CCM) took 61% of the overall vote, and Dr. Wilbrod Slaa (Chadema) took 21% of the overall vote. All in all, only 45% of the registered 20mill voters in TZ turned out- which was expressed as being very very poor. Slaa has challebged the results, demanding a recount and insisting that the election was rigged by Kikwete and CCM (he could easily be right). I am saddened by this result, as I think Chadema is the best direction for TZ, but obviosuly the people don't agree....what do I know anyway? However, this year is the best that Chadema has ever performed in the election. Who knows, maybe next time they will overtake CCM? As the old TZ saying goes, "kidogo kidogo hujaza kibaba" (a little bit and a little bit fills up the cup). Sat 18- Finish climbing, meet parents in Arusha, spend night. Tues 21- Stay 1 day in Stonetown. 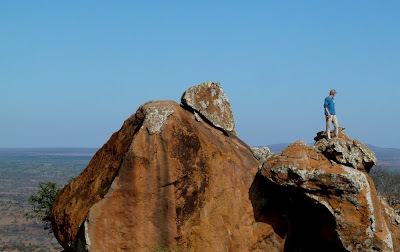 Kwenda Rocks in Kwenda, just S. of Nungwi. Its looking to be pretty sweet. I'm very excited to return to TZ, travel around, and see what more this great country has to offer!